Journeys – particularly journeys that include train rides – have always been good opportunities to reflect and reassess. Getting out of the routine and into thought and conversation can fire up the brain cells in unexpected an productive ways. I can’t say I was very ‘productive’ last weekend, but I did get a lot of thinking down about issues that have been on my mind for quite a while. One of those issues is the future of Eolyn. As many of my followers know, Eolyn was not originally intended as the first book in a trilogy. This had a lot of implications for how Eolyn and its eventual sequel, High Maga, were written and then rolled out onto the market. My first novel, Eolyn, was picked up by Hadley Rille Books at a time when its companion was just a sparkle in this author’s eye. It has been such a great privilege for me to work with this small press, and to this day I would not give up that experience for the world. But at the time, we put no thought to a strategy for marketing full trilogy. Simple things like a title for the series, a well-timed release schedule, and a cohesive look for the covers weren’t taken into account, in part because they didn’t yet need to be. Meanwhile, Eolyn’s journey continued to grow. High Maga was released almost two years ago, and Daughter of Aithne now waits for its chance on the shelves. With three books under my belt, I’ve been reflecting a lot on the best way forward, and I’ve come to an important decision: Eolyn needs a new start, with a marketing and release strategy that will capitalize on the series as a cohesive whole. 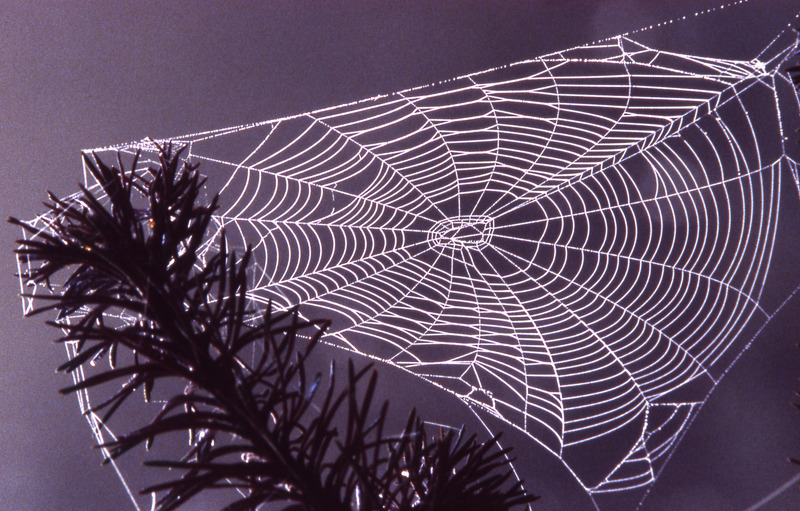 Spider web; Ed Austin & Herb Jones; 1987. From the Yellowstone National Park online photo collection. Following the discontinuation of the first editions, there will be a (hopefully brief) hiatus to regroup, re-edit, and redesign in preparation for a new launch. As part of all this, I am giving the series a new name: The Silver Web trilogy. Many of you probably know that Eolyn and High Maga are currently linked in the market as books one and two of Eolyn Chronicles. I’ve never been happy with “Eolyn Chronicles”; it is a generic title, developed almost as an afterthought when High Maga hit the market. The Silver Web, I think, does a much better job of capturing the spirit and uniqueness of the series. You might guess, correctly, that the title refers to a jewel made by Briana of East Selen and gifted to her son, Akmael at the beginning of book one; a magical amulet that binds the destinies of Eolyn and Akmael as they meet and clash on the future of women’s magic. However, the title has a larger meaning as well, referring to the intertwining of fates of all the characters in the series, from Briana to Kedehen, to Mage Corey and Akmael; Eolyn and Ghemena and Tzeremond; Adiana, Mechnes, Rishona, and Taesara. Every character in the series is connected in some fashion to the web of magic left behind by Briana of East Selen, and this new title honors her sacrifice and legacy. This is a big transition for me, and a little scary. There are many unknowns that I can’t yet talk about (mostly because they’re unknown). My one reservation is that readers who have been through books one and books two, and are anxiously awaiting book three, will have to be patient a little while longer. Really, I feel terrible about making you wait! But I also need to be faithful to what my heart is telling me about the best way to go forward. As the details become clear, you’ll be the first to know, right here on this blog. In the meantime, I very much appreciate your support and patience. And I hope you share my excitement as we chart a new course for Eolyn. I love the series title. LOVE! I think you’re going in a great direction with this, Karin. So exciting and SCARY!!! But good. Your trilogy will thank you. Oooh! I had no idea. Intrigued. I love the work that you have done and hope that I can continue to be a part of the magic. Thanks, Darla! The print & ebook editions off line, but the audio editions are staying on the market for the foreseeable future. Different rules apply there, and well, I want you to continue being part of the magic, too. 🙂 We will definitely stay in touch going forward.